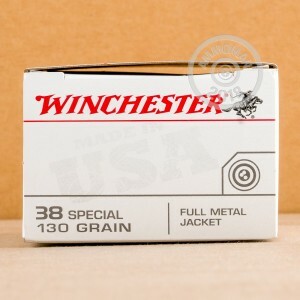 You'll get plenty of range training in with this 38 Special 130 grain FMJ ammo by Winchester. 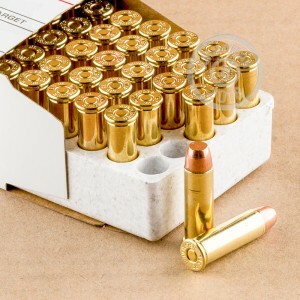 This ammo is perfect for target practice or plinking with friends. Each round contains a 130 grain full metal jacket bullet that does not expand, which is just what you are looking for out of a training ammunition. The performance you'll get with this ammo is outstanding, with dead-on accuracy and shots that are consistent, round after round. A reduction in barrel fouling is also convenient, especially if you have 500 rounds of ammo to fire. You won't have to worry about rushing home to clean your barrel. These 38 Special rounds are brand new production, have boxer primers and brass casing, and can be reloaded. Just like all of Winchester's products, these rounds are such great quality, for an affordable price. You'll save when you buy in bulk, as well as qualify for free shipping with your purchase. Don't hesitate! Order your 500 rounds today!